Oh, wow! It’s General Motors’ 1958 paean to designers and stylists and, erm, planned obsolescence. There’s something for everyone here; if you love MidMod stuff, bask in the parade of late-’50s design. Or just listen to the music (listen to it!). Or have fun with the narrator’s elocution vs what we have now, or compare and contrast what pro-America sentiment sounded like at that time vs what we have now. Or even if none of the above, this film is just fabulous. It has a bizarrely overcooked, heavenly-choir type of intro sequence which is watchable (once), but the real action gets under way at 1:34. The close-up at 8:59 is a cool old 3M Wollensak portable reel-to-reel tape deck; I used to have one that was my folks’ (and I think their folks’ before that). It didn’t quite have tailfins, but almost. 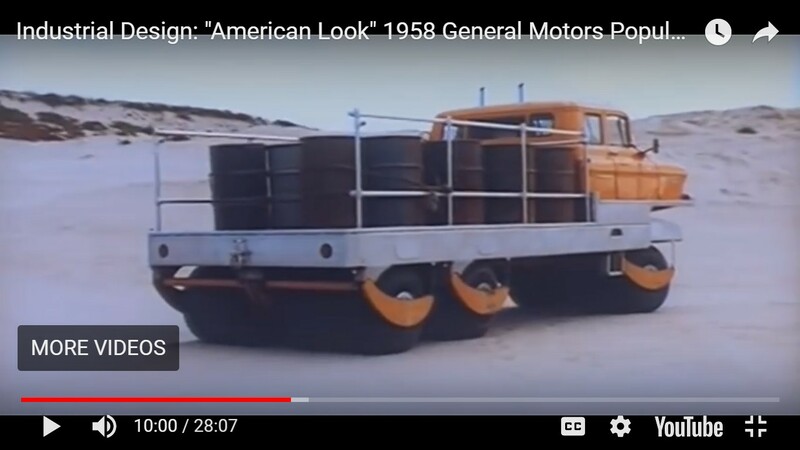 Although this film is a GM production, not a car or car part appears until over 20 minutes in—then we get a gander at the ’59 Chev designwork under way. Also suspicious: there are non-Frigidaire appliances pictured. It’s GM shovelling plausible deniability and whistling tunelessly: What? No! This is a film celebrating design and style! It’s nothing to do with galloping consumerism! And even if it were, we have nothing to do with any of that; we’re just in a celebratory mood because designers and stylists are excellent! Tut tut, looks like rain! It is interesting to see how subtext was handled in those days when marketing psychology was less advanced on both the sending and receiving ends. Attention spans were longer back then, as it seems; the movies of the day move along slower than we have now. I find 1.25× speed just about ideal for this, right from the start, but with lots of pausing to admire and lament: why, oh why can’t we have stuff that looks like this? Santa, couldn’t’ve you brought me one of those? Or one of those! Or a couple of those? I had to speed it up to 1.5 times, but fascinating nonetheless. The narrator said “America” and “Americans” so often I lost track. That is the coolest thing I have ever seen! I was born in 1958! Obviously, it has to be fake, because they didn’t have computers. 🙂 I can’t believe they mentioned women! Back then very few women worked outside the home. This film was an absolute treat! Googie! someone get me a time machine please. Films/commercials/TV are definitely “speeded up” today, but I summoned my quiet patience and watched at normal speed. The consumer fineries weren’t seen in my lower-middle-class tract-home neighborhood, but were featured in the display windows at the nicest department store, and of course in the national magazines like LIFE that I was starting to read in about 1958. If would be fun to get a cohort of “MCM” enthusiasts (of varied ages) to name the locales, consumer products, and so on–definitely not just filmed in SE Michigan! Great watch to cap off the day, and I watched at normal speed! I enjoyed a little of everything, and say what you will about the immeasurable metric of taste, but the tribute to designers and the imaginative colorful world that was portrayed in the film is something that we could all stand to take inspiration from today, where anonymity, shame, and cold efficiency are what motivate us as consumers in the current template for planned obsolescence (how’s everyone’s new iPhone 8 and Xs working?). The most enjoyable part for me was the car design, of course. Seeing the old methods of sketching, mixing and matching seemingly random sketches into common themes and NOT basing final decisions on a dumb focus group is fun. I love watching the clay modeling too, I don’t know how prevelant that practice still is in the industry, but despite technology being night and day from the rendering perspective, sculpting out a design full scale and refining it by hand it gives the final design a character attractive to the human eye that no computer or 3D printer will ever touch, and I kind of suspect a few cars in the last several years are skipping this process. American design and STYLE have had a hughe impact on design world wide, if you look at most stuff shown in this 1958 documentary, you’ll see the influence of American design even today at our Swedish friends of Ikea. The Weber barbecue is still available today as are many of the stuff we see. Italian designers like Pininfarina were highly influenced by American design, shown in cars like his Austin Camebridge/Morris Oxford (Farina’s) 404 Peugeot, FIAT 1800 and Flaminia Lancia. But hey Mike, there was more, in 1960 GM launched another mytical car, the Corvair, whose style and grace, its floating roof would have an impact on car design for over a decade, Paul Bracq’s Mercedes 230 SL “Pagode”, Louis Bionniers Panhard BT 24, Claus Luthe’s NSU R080 and Volkswagen (actually NSU) K70, the small NSU Prinzes, the Renault R8 by Charbonneaux (who worked for GM) and even the Range Rover’s floating roof is inspired by the Corvair. American design has always been practical and light, spacy, but always designed for the future. I love this. I was just talking to my brother the other day about how dowdy furniture is and how I’d be more excited about buying it if it were more Mad Men and less Downton Abbey. Bring on the mid century designs. More Eames loungers and fewer wingback chairs. But still only black and gray suits and tie. Now it’s only black, gray, and white cars. There’s a huge contrast between the stark geometric simplicity of the household designs and the baroque overstuffed ’58 GM cars. I wonder if the film’s writers were sneakily trying to point this out? If so, I see what they did there! This era comes in at the time of my early memories. 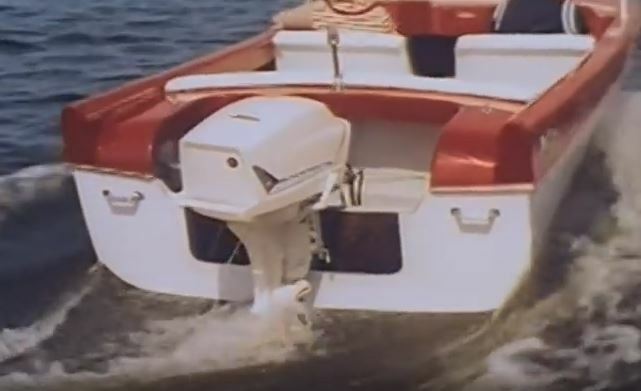 We need more motorboats with tailfins! Interesting…. I was wondering if they were ever going to get to cars. But when they finally did, it shed new light on the inspiration for the wild ’59 Chevy. Perhaps the batwing decklid was influenced by rooftops like those on the building at 14:30. Some of the products shown seem like they were still from the future – most 1950s fans I’ve seen don’t have modern-style narrow-spaced protective grilles like the one shown here, and the svelte TV looks more like one from the ’60s. The Eames chairs and lounge are of course timeless and still available and wildly popular today. By the way, those *are* GM-built Frigidaire appliances from their 1958 line – close-up views of the French-door oven and fold-away stove cooktop shown in the film can be seen in this kitchen: http://retrorenovation.com/2012/08/09/fold-down-electric-burners-and-other-treats-in-bonnies-1958-kitchen/ (Frigidaire appliances from the ’50s and ’60s were extremely innovative in every category). The countertop appliances shown are from General Electric, but I don’t think Frigidaire made many small appliances at the time. Ahhhh, RetroRenovation.com has claimed many an hour I really shouldn’t ought to have been wasting. Funny how this ‘American Design’ was graphically descended from Teo van Doesburg; furniture design from the Danish Modern, & the Architecture rested on a bunch of theories imported from some crazy Europeans (Mies van der Rohe, the Saarinens, Le Courbusier, ‘tho they show the Frank Lloyd Wright Price Tower in Bartlesville). Funny how the only things that now look old and completely outdated are the vacuum cleaner, that pre-selectric IBM standard, and, ahem, that car at the end. Did anyone ever really have an office that look like those? Maybe the producers at Jam Handy. Called “planned obsolescence” if Detroit, but “continuous improvement” if Asia? Honda [et. al.] brought out ‘all new cars’ every 4 years for awhile and built market share. Hmm, where’d they get that idea?